This brief guide is probably the best place to start for newcomers to TADS 3. It contains instructions for installing the system and compiling a basic game, an explanation of the other documentation, including guidance on where to go next, and a sample game newcomers can experiment with if they want to dive straight it. This tutorial introduction is a great starting point for anyone new to TADS 3 and new to programming. The book opens with the basics of getting TADS working on your system and setting up your first simple game, so even if you've never done any programming before, this will help you get going quickly. The tutorial then leads you step by step through the design of a full-scale example game, showing how to use TADS to implement the effects needed in the game. By the time you're done, you'll know your way around the system and you'll be able to write your own games. This book can also be viewed in a PDF version. This version is recommended if you want to make a printed copy. 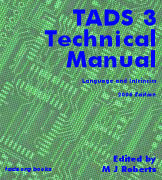 Part tutorial and part reference, Learning TADS 3 is a perfect place to start for confident beginners, and for people with a little more programming experience. This book is designed for learning TADS on your terms - it's organized by functional area, so once you've mastered the basics, you can skip around to focus on the areas you're most interested in. As you develop your game, you can return to the book as a reference, to review the details of particular TADS features. This book refers to a collection of sample games, which are available as a separate download - click here to download. This is a comprehensive overview of the TADS 3 library, covering nearly all of the key classes and functions. It uses practical examples that illustrate how to use library features to accomplish common tasks. This book is a reference to the TADS 3 language and the T3 VM, including the standard intrinsic functions and classes. It covers the language and VM features in depth, so it's the place to go when you need to find the details on the system. This is a collection of technical articles about key aspects of the TADS 3 system and the Adv3 library. These articles provide detailed, task-oriented information on topics of interest to most TADS 3 users. This is an extensively cross-referenced and hyperlinked compilation of information on the Adv3 and system libraries. The entire library is indexed here, with the latest information generated directly from the library source code. TADS 3 System Change History. This is a chronological log of changes to the TADS 3 language, tools, and Virtual Machine. Adv3 Library Change History. A chronological log of changes to Adv3, the standard TADS 3 Adventure Framework Library. HTML TADS Interpreter and Workbench Change History. This is a log of changes to the HTML TADS user interface, which includes the HTML TADS Interpreter and the Workbench development environment on Windows. These books are copyrighted by their respective authors. In general, they may be used and distributed without charge, subject to certain restrictions. Please see the individual books for full copyright and licensing information. Some of these books are offered in the "PDF" format. To view PDF files, you need the Acrobat Reader software, which is available as a free download from Adobe.